The sight of these predators together with the soft melody from the wind chime tubes can help discourage pesky birds from damaging your siding or building nests where you don't want them. Uses our economical imported Mid-Size wind chime tube set. Owl is made from about 3 feet of "1x6" pine. Eagles measure approx. 12" from head to tail. 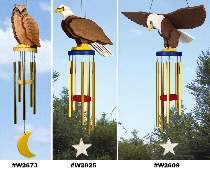 Order plan, wind chime string, yellow eyes and wind chime tube set separately or see Special offers and SAVE.